So last night twitter was alight with the announcement that Calling functionality is now in Teams !! Wohooo so this morning i wanted to take a look at what documentation and what this means for Teams and if your using Skype for Business with Microsoft Phone systems already. Ill also try and highlight the key points and also provide any useful articles i find on the way. If you have CCE or using an on premises Lync / SfB Server to bring your PSTN into Skype for Business Online this wont work with Teams! Also federation is not available and calling does not bring federated calling functionality. This is to me is a massive feature that needs to come into Teams and is being worked on. What does Calling bring to Teams with this announcement? 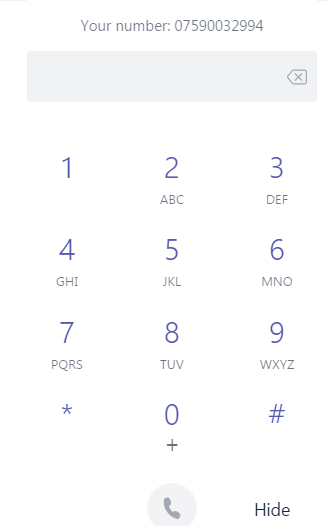 We can now make and receive PSTN calls in Teams and we have the following feature set. Prerequisites for Calling in Teams ? Calling requires additional licences for each user on your Office 365 Tenant. Calling Plan (formally PSTN Calling Plan) licence for each user. Phone System is add on licence except for E5 where its included but this doesn’t included a Calling Plan so you need this as well. Calling Plan comes in different shapes and sizes and you can have a Domestic Calling Plan and a Domestic and International Calling Plan. The Phone System and Calling Plans are the same add-ons as you may have used and licenced users before with Skype for Business Online. If your users have these already then you have the prereq licences already. This lists all the prereqs and whats required to enable calling in Teams so lets take a look and ill call out any key points i think. 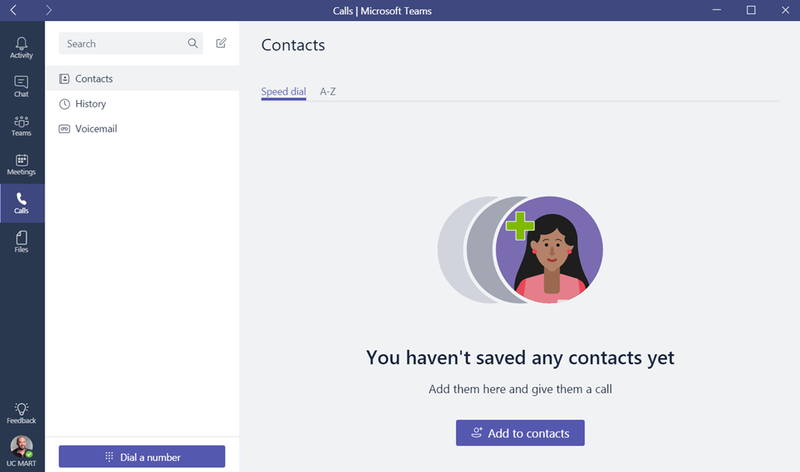 As you can read Teams has hooked into the existing engine for Calling Plans from Skype for Business Online but now you can use this with Teams. 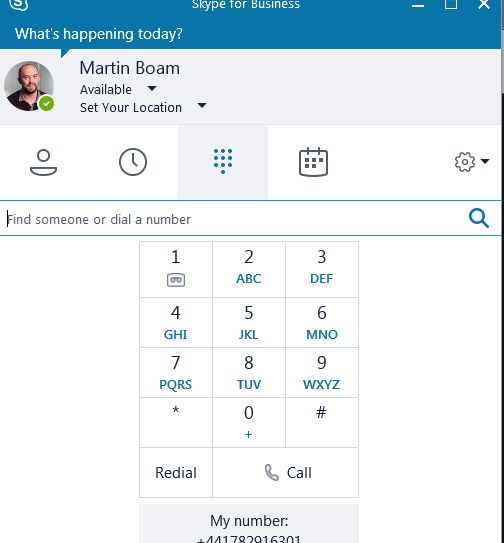 To enable the Calls tab in Teams and allow your users to make and receive PSTN calls, you will need provision users for Phone System and Calling Plans. Hybrid Voice is not supported in Teams – Hybrid Voice is currently not supported in Teams. Hybrid Voice customers are not advised to change any of the policies to receive calls in Teams, as this will cause service interruptions. 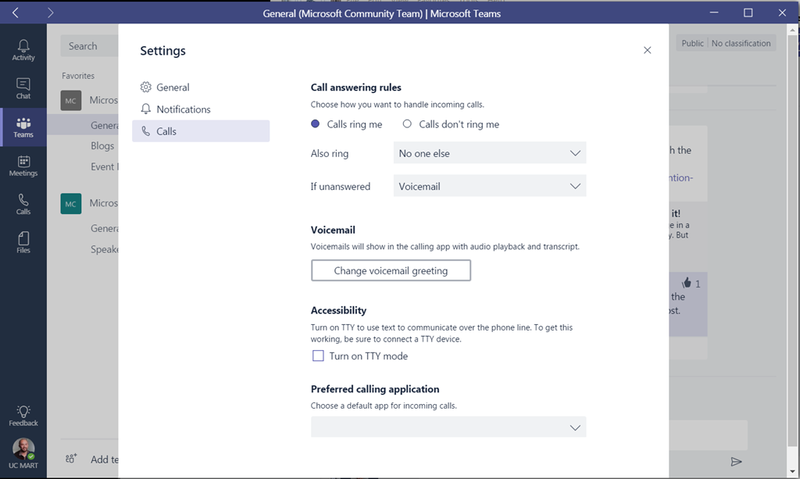 Federated calling is not supported in Teams – Federated calling (calling between tenants/companies) is currently not supported in Teams. Federated calls will always be routed to Skype for Business regardless of how you configure calling, until it’s supported in Teams. Ok for me im not using Hybrid Voice so im suitable for Calling in Teams and federation i know isnt there yet. Next we mention the Team interop policy using the Skype for Business cmdlets which is interesting and we mention redirecting calls into Teams. 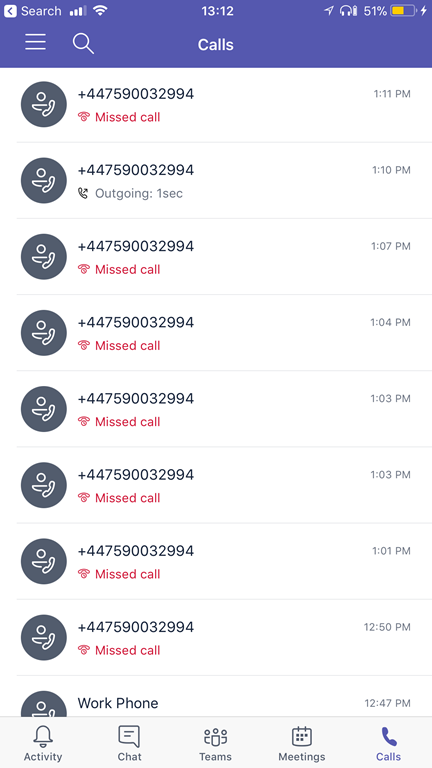 So it appears you cant have PSTN calling fucntionality in both SfB and Teams at the same time which is interesting but understandable to a degree but as we covered there are some difference still such as Skype for Business Online IP phones how will they cope if you redirect into Teams i guess they dont work but lets check. 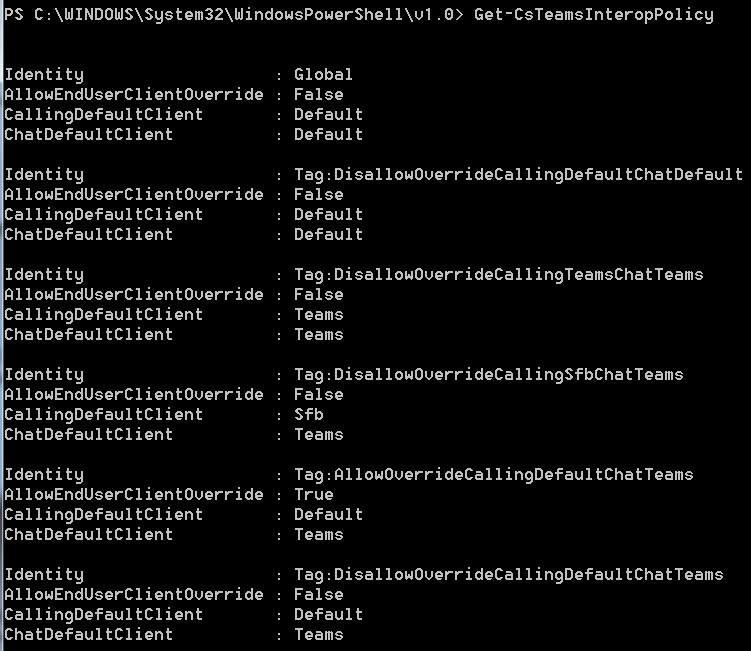 Currently, changing CallingDefaultClient to Teams will also affect calls to Skype for Business IP phones. Incoming calls will not be received on the phones and will only ring Teams clients. Please consult the Skype for Business to Microsoft Teams Capabilities Roadmap for information about support for existing certified SIP phones. Whats are Teams Interop Policies ? Teams interop policy enables an IT pro to designate a user’s preferred application for receiving chats and calls. It can be configured to keep communications in Teams and Skype for Business siloed, or it can be configured to enable users to communicate across application boundaries. 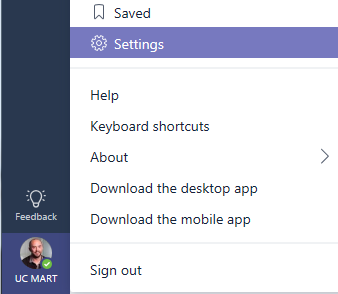 Teams interop policy can be defined at the tenant or per-user level, and can even be configured to enable users to choose what application they would like to use to receive their chats and calls. This built-in flexibility is intended to help your organization trial, evaluate, and migrate to Teams at the pace and in the manner that is best suited to your organization. Interoperability between Teams and Skype for Business is supported between users who are purely online (Skype for Business Online and Teams), and users homed in a Skype for Business on-premises deployment in a mixed (Hybrid) deployment topology. 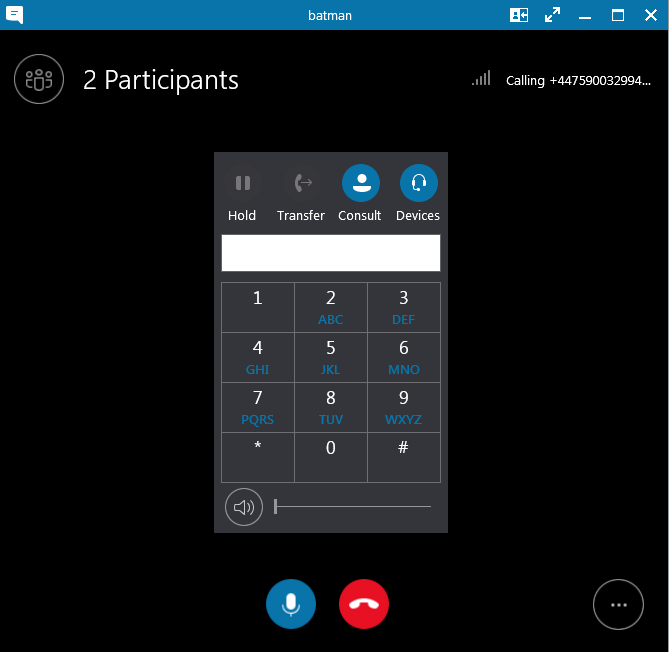 Interop support for Skype for Business Hybrid does not include Hybrid Voice capabilities delivered through CCE (Cloud Connector Edition) or on-premises PSTN connectivity using existing deployment–or commonly called as OPCH (On Prem Config Hybrid). Teams users cannot be enabled for PSTN calling capabilities using CCE or OPCH. Default Team Interop Policy and whats it mean to me? So i have SfB Online with Phone System and a Calling Plan already then this means ? 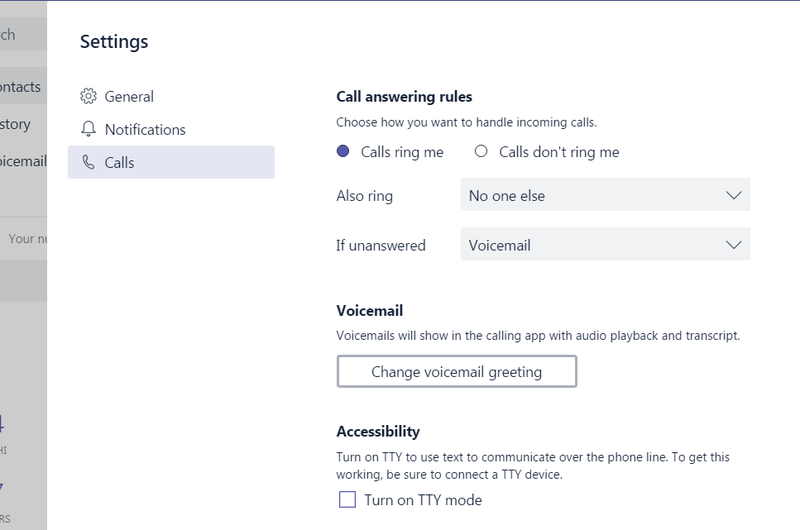 By default, VoIP, PSTN, and federated calls to your users will continue to be routed to Skype for Business until you update the policy to enable inbound calling to Teams. 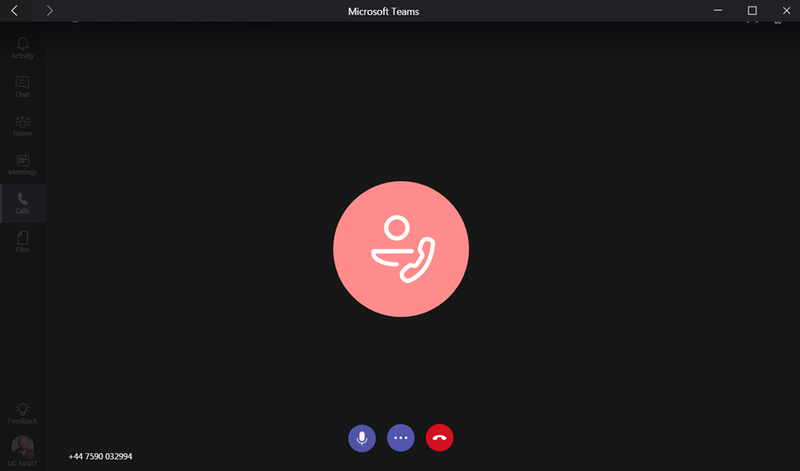 If you don’t have Skype for Business Online enabled and only use Teams ? Only outbound PSTN calling will be available in Teams. You will need to alter the Teams interop policy assigned to your users to receive PSTN calls in Teams. Lets go check my Teams Client and see what i find ? Here i have not yet changed anything on my tenant and have made no changes to Team Interop Policy. So In SfB i still having Calling which is would expect as i made no changes to Team Interop Policy. Theres the hold and transfer buttons as well. 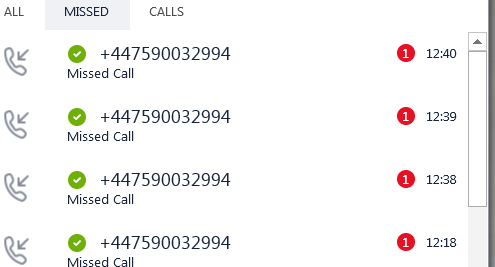 So i can make outbound calls on both Skype for Business and Teams but only have inbound PSTN calls into Skype for Business. Let look at the Teams Interop Policy and set the redirect for PSTN calls to come into Teams Only. The ChatDefaultClient parameter defines how chats are routed between Teams and Skype for Business, and the default global value of this parameter is set to Default. At the present time, the ChatDefaultClient parameter is not respected by Teams. 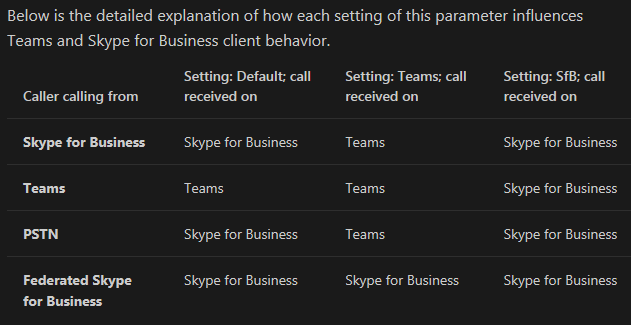 The CallingDefaultClient parameter defines how calls are routed between Teams and Skype for Business, and the default global value of this parameter is set to Default. 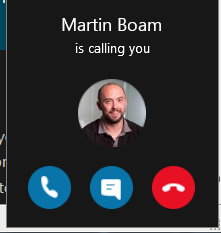 Currently, changing CallingDefaultClient to Teams will also affect calls to Skype for Business IP phones. Incoming calls will not be received on the phones and will only ring Teams clients. The AllowEndUserClientOverride parameter accepts Boolean value (TRUE or FALSE), and when it is set to TRUE, Teams will allow users to select where they want to receive their calls–Teams or Skype for Business, and users will be able to change their primary application at any time. The global default value for this parameter is FALSE, thereby users will not be allowed to choose their primary application without intervention from administrator. and the other policies can be assigned on a per user basic so you can test. So its states Global is assigned by default to all users. So lets as an admin we can assign one of the existing Team Interop Policies to allow inbound PSTN calls into Teams for my user only for testing. We dont want to modify the global and send all PSTN calls into Teams without testing first. 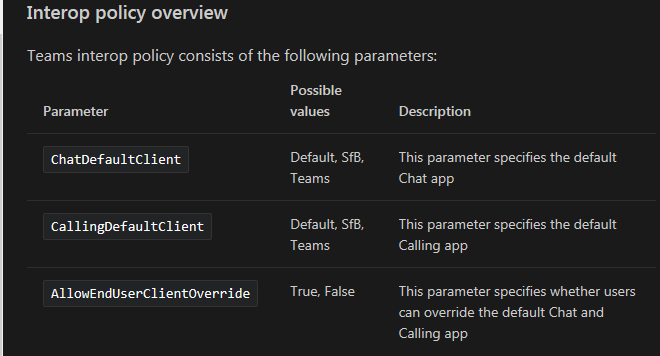 To bring inbound PSTN calls into Teams we need to a policy that has the CallingDefaultClient as Teams so let use DisallowOverrideCallingTeamsChatTeams policy. I didnt see a toast for the incoming call hmmm so the call came into Teams it seems. Even with the Teams client open i just get missed call and the caller goes to voicemail. Lets sign out and sign back into Teams maybe. Still the same. Lets close SfB Client as well. Nope still voicemail lets grab a coffee and come back in 5 minutes. I tried the Teams client on another PC and it worked straight away. So whilst waiting i wanted to look at web client and Calling is there as well which is awesome! Now this i really like as i don’t need a client to have calling functionality as i can do it from a browser. 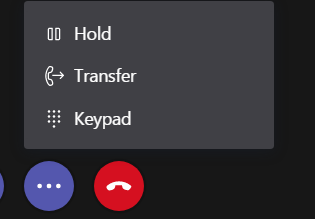 So it seems even after lunch i still dont recieve calls in the Teams desktop client or web client on my Windows 7 laptop. i know Windows 7 shoot me now. Ill investigate this after. So lets keep going as my Windows 10 PC is fine. lets sign out and sign in, both my clients dont have the settings yet so ill wait a while. I have my number stored in contacts so shows my name where the teams client show my mobile number. and here its ringing in teams, again i could not my Windows 7 pc with Teams to get an incoming call but on Windows 10 machine it worked fine. For me i like the ability to be able to choose which client receives the incoming PSTN calls so ill leave myself with the custom policy. As i sign off this blog i see another Tech Community post accouncing the updates for Practical guidance for Phone system with Calling. Interop policies have been depreciated now, please look at upgrade modes.